View from from the top. It'll cost £15 to enjoy the fun of sliding down the world's "longest and tallest slide" — the AcelorMittal Orbit, but the structure's designer thinks it should be free. Anish Kapoor, who told the Guardian the slide idea was "foisted" on him by Boris Johnson, worked with Belgian artist Carsten Höller (who built the slides on the outside of the Southbank Centre last year), to create the new attraction. Now the British-Indian sculptor thinks everyone should enjoy it, whatever their budget. But it's not that simple. Last year the Orbit was reportedly losing £10,000 a week; making it free would undoubtedly result in greater losses for the structure. 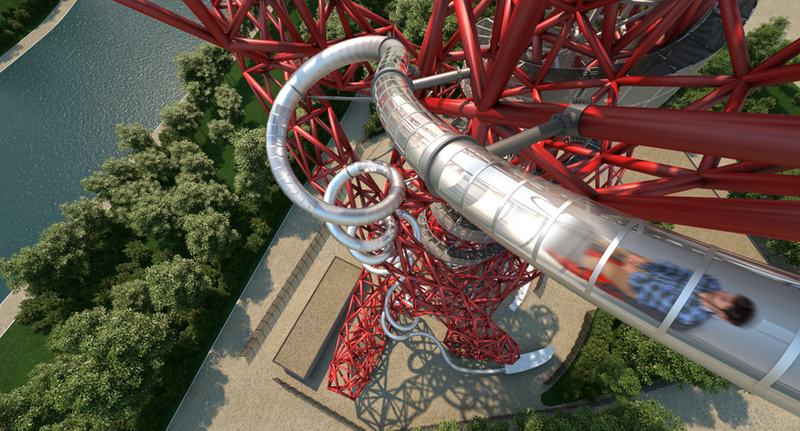 "I think Boris should be the first person to slide down it," Kapoor told Londonist. The key question is whether the 114m high sculpture can still be considered art, once it becomes a slide? "Some people will see it as art, others as entertainment," Kapoor explains, much like his partner's blockbuster show at the Southbank centre last year. "I don't have an issue with people just enjoying it as a giant slide, but I'd like people to get something more out of it." However it's interpreted, the Orbit's slide will undoubtedly be popular, and help to claw back some of those financial losses. And for anyone who didn't get the chance to ride Holler's slides at the Hayward Gallery and who hasn't been up the Orbit, a go on this particular helter skelter is a must.